Roxbury's Dudley Square in 1910. 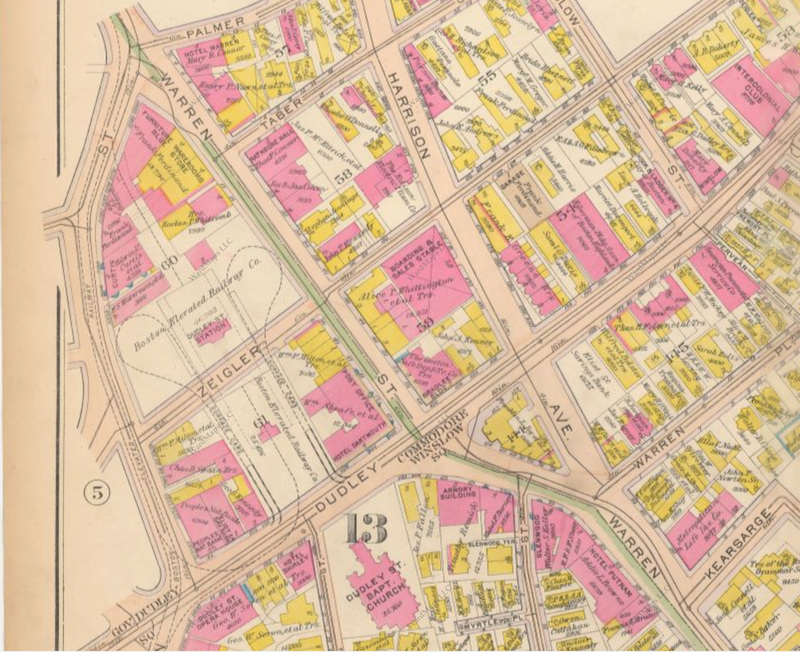 1915 Bromley map of Dudley Square. The Dudley Square area's residential, commercial and transportation infrastructure has experienced several phases of development and redevelopment. This foot tour will focus upon the process of the Dudley Square area's urban development. Beginning by Northeastern University and ending in Roxbury Crossing, the tour will show the evolution of Dudley Square and the surrounding area through remnants of the various stages of the area's transit network and commercial/residential development. The tour will be held on Thursday, January 1st, 2015 (New Year's Day) at 12 PM Noon. The tour will begin by the Forsyth Street entrance to Ruggles Station on the MBTA Orange Line, on the Northeastern University campus and a two minute walk from Northeastern University Station on the MBTA Green Line. The tour will end at Roxbury Crossing Station on the MBTA Orange Line and Bus Routes 19, 22, 29 and 66; Roxbury Crossing is also a 10 minute walk from Brigham Circle Station on the MBTA Green Line. The tour will last 90-120 minutes. Rates are as follows: $20 for Adults 18+, $10 for Children 13-17, Children 12 and under free. Group rates available upon request.